I have that jumper on my Christmas wishlist for my boyfriend :) It is so cute! That blush duo looks incredible, I have never actually tried any Illamasqua but Im being convinced more and more everyday. Might have to look into this one more! That Illamasqua blush duo was on my wishlist too, until I did a price comparison on Sephora's website - you actually get about the same amount of blush you would in a single, but they charge a good few pounds more for it! Not worth it I think, I'd rather save up and get the both of them individually. But it was smart of them to put two of the best colors together! I've wanted a mixer for so long! Gonna have to put it on my Xmas list. I love the jumper too. That ring is so cute!! Those blusher's look lush too! And, how cute is that recipe box? wow so lovely stuff <3 i also want them :)! i love that blue mixer! we received some red kitchenware for our wedding recently, & i have to say, i absolutely LOVE bright things for the kitchen! *Sigh* So many amazing things!!! 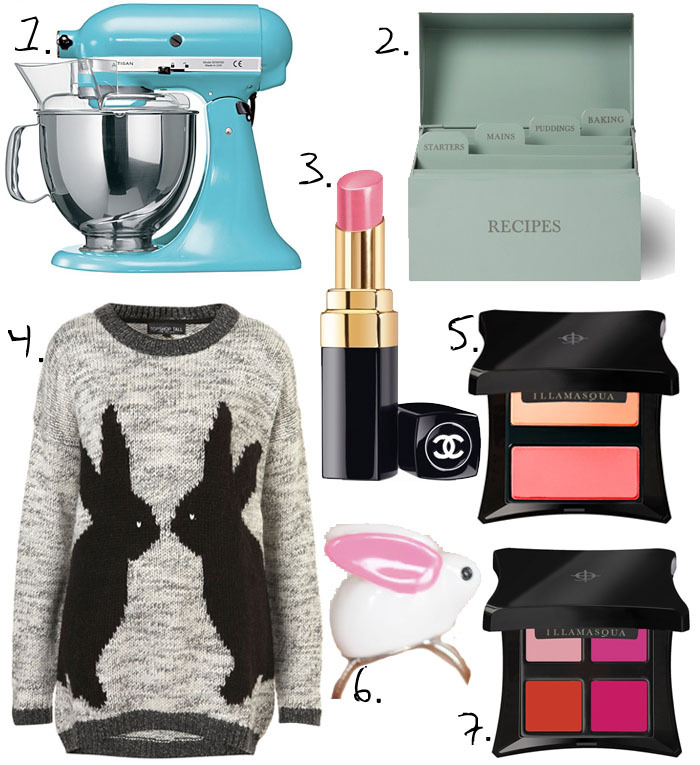 oh gosh, i want that bunny sweater! ..or just anything with bunnies on it for that fact. I want all of this, the blush quad looks amazing! The colour of that kitchenaid is amazing, I have a red one and love it so much. That kitchenaid is adorable, I love the colour, having one would defnitely urge me on to bake more often! and that rabbit jumper is so lovely; I have a huge penguin jumper and it's the cosiest (and cutest) thing I own. I often find myself egging the weather on to get colder so I can wear it!